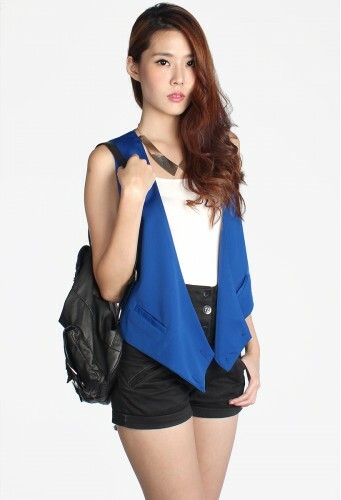 Look sharp with the collarless Calder Vest. Its contemporary, clean look adds a polished finish to even your most basic ensembles. Don metallic accessories to top it all off. Made of two layers of garbadine-polyester blend (non-stretchy) at lapels, fully lined at back (lining: polyester; non-stretchy). Features a draped front with functional side pockets. and squarish cut-out back detail. Looks best worn unbuttoned.